The biggest design limitation is that we need to be able to transport the board to and from conventions, especially ones where there will be a large audience for miniatures games. Our solution is to build the board in 4 pieces that we can fit into a suitcase and then assemble at the table. It has to be light, so foam is the obvious bulk of the material. 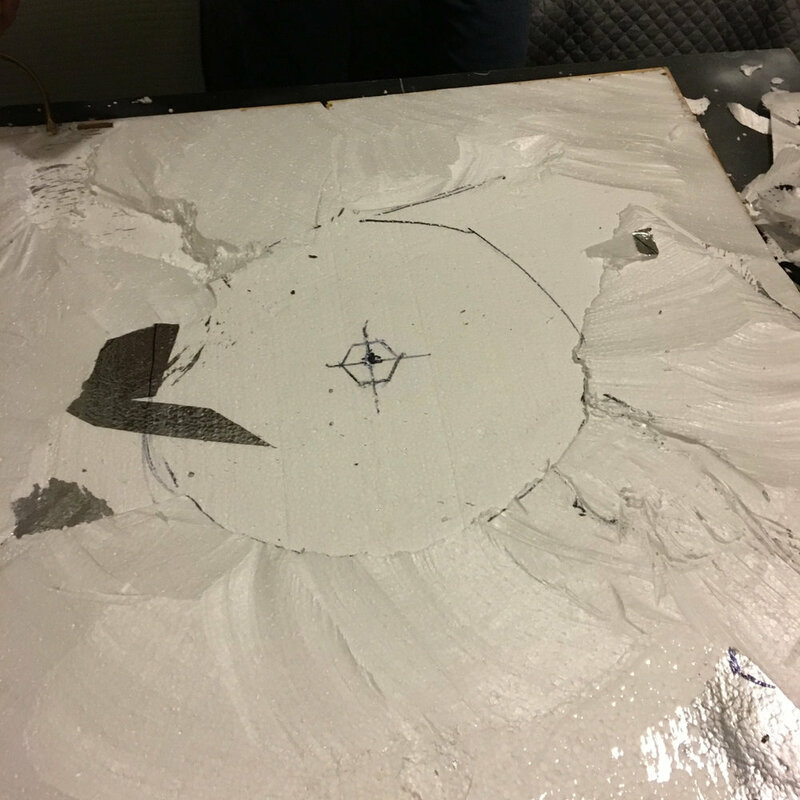 The first step was to get foam cut up and framed for durability. We were really inspired by a board we saw at the Wild West Exodus booth at GenCon, it had a really nice hilly flow to it so we knew we wanted to add that feeling to ours. The next step after finishing the frames was to glue a few layers of foam onto the quadrants and sculpt some topography. Our friend Zach came over to help me with that part, together we sketched some ideas and started making a huge mess. The bigger mess came when we started sanding everything smooth. It took longer to vacuum up all the foam bits than anything else. One of the big challenges of designing this was figuring out how to get hexes onto this board. I tried looking for cookie cutters or templates of any kind. Finally I ended up getting a ton of laser cut MDF hexes to layer on. I’m getting very excited about the way this is shaping up. I am hoping to have this done in time to show off at Adepticon so wish me luck! What do you think of our fancy board so far?